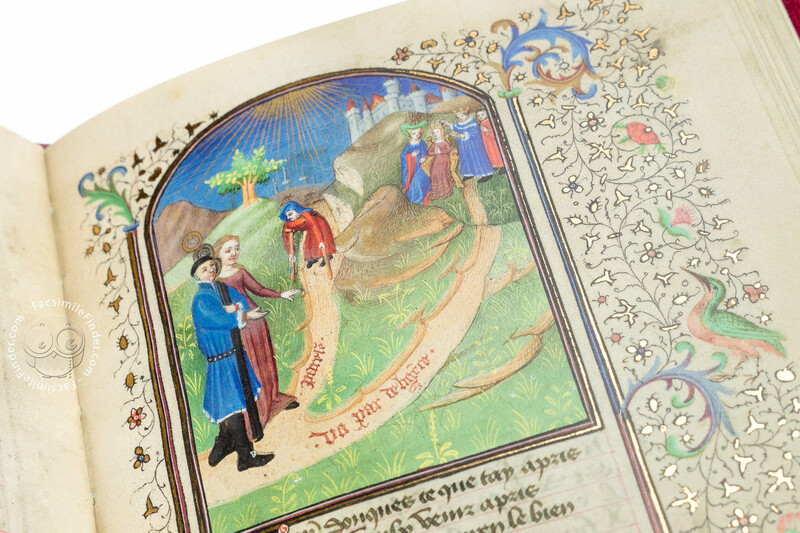 While at first glance it appears to be a Book of Hours, Jacques Bruyant: The Way of Poverty or Riches is in fact a charming picture book of secular poetry. 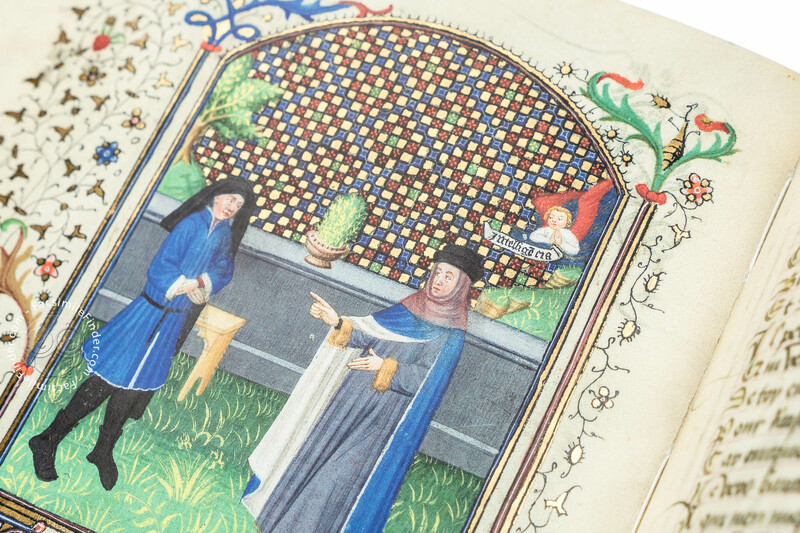 It is a guide to happiness for the newly-wed nobleman, portraying in easily comprehensible pictures the age-old issues of living and working together congenially. As in a knightly adventure novel, the narrator sets out on a dangerous journey during which he is constantly confronted with the virtues and vices of the world. The text was written around 1342 by Jacques Bruyant, a clergyman from Paris. A great number of copies bear testimony to the popularity of his work. 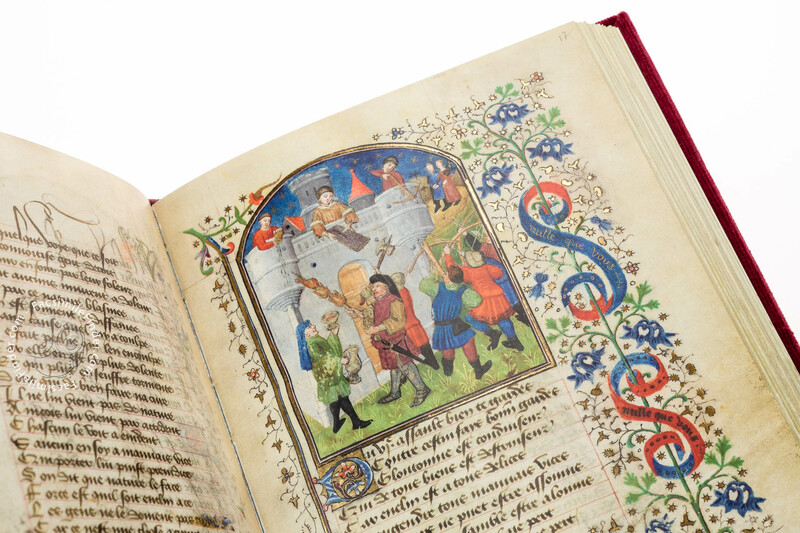 However, only one single copy has been illustrated with countless colourful miniatures: the illuminated manuscript kept in the Free Library in Philadelphia under the shelf mark Widener 1. The exuberant decoration of The Way of Poverty or Riches immediately catches the eye: its 73 folios in the format of 20.7 x 14.4 cm are embellished with a total of 46 generous miniatures whose glowing colours are charmingly highlighted with gold leaf, brush-applied gold, and even silver in some parts. In addition, each of the miniatures is framed with dense scrollwork consisting of gold-shimmering ivy leaves, interspersed with acanthus leaves, countless little flowers, and often fruit and animals. 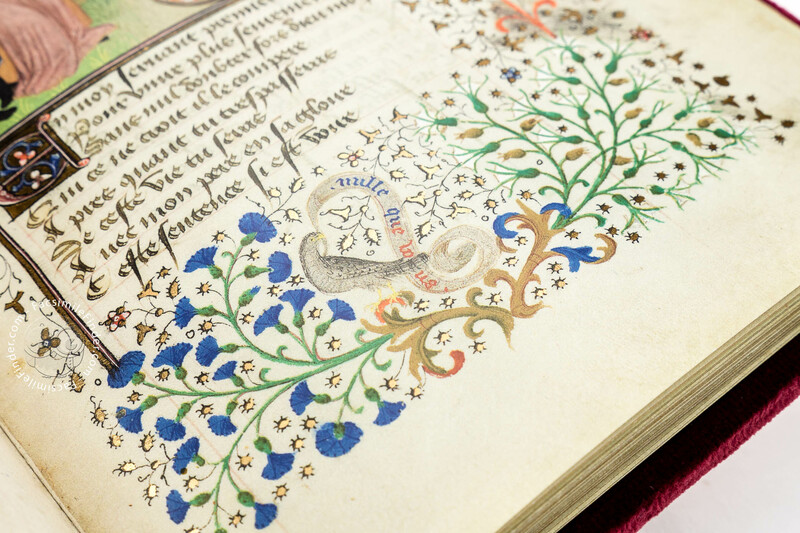 Seventy-four carefully painted initials on golden ground decorate not only the illustrated pages but also some text pages that are likewise often enhanced with a golden vine scroll. The fascinating picture gallery of The Way of Poverty or Riches carries us off to the domiciles of medieval men, even to the seclusion of their sleeping chambers, past labouring peasants, blooming fields and green hills. We gaze up at the walls of massive castles or wander along winding paths leading down to the narrow streets of cities in the distance. As unspectacular as these details may seem, it is precisely their ordinariness that proves captivating as an authentic document of reality, reaching us through the centuries. 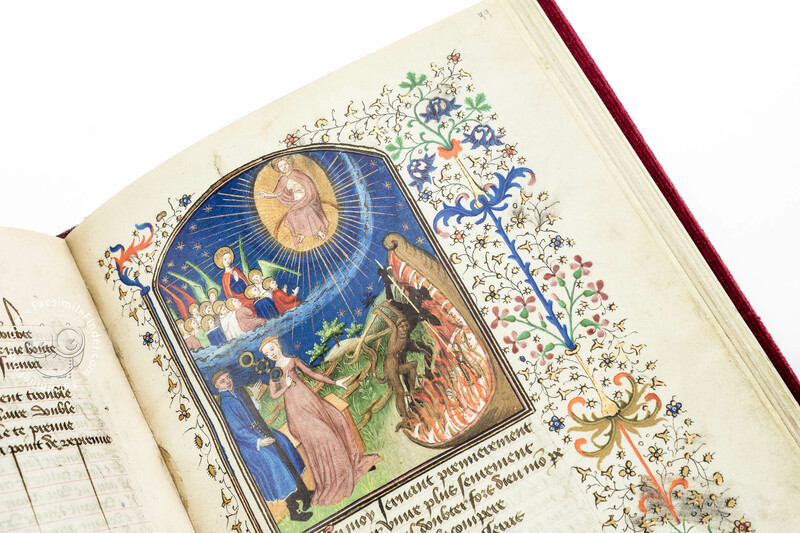 This priceless work is part of a small group of illuminated manuscripts made in the circle of the famous Bedford Master from Paris. Starting from c. 1410 the talented artist remained one of the most significant illuminators in Europe for more than a quarter of a century. His art was inspired by the genius of the three Limbourg brothers, but he also introduced completely new creative elements. The well-balanced compositions from his prolific workshop are striking both for their refined colouring and for an unseen three-dimensionality of forms and faces. 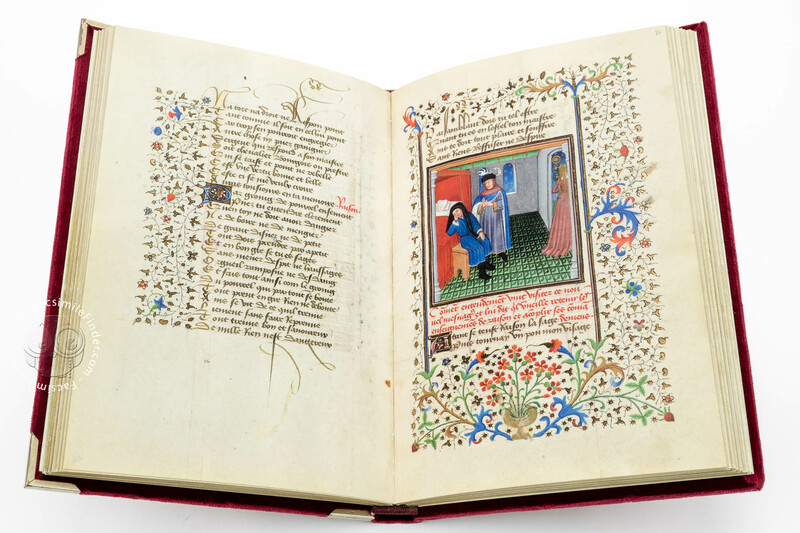 His artistic influence is also visible in The Way of Poverty or Riches: the accomplished handling of perspective, the fresh colouring of the miniatures and the sumptuous borders impressively convey all the magic and splendour of the Bedford style. 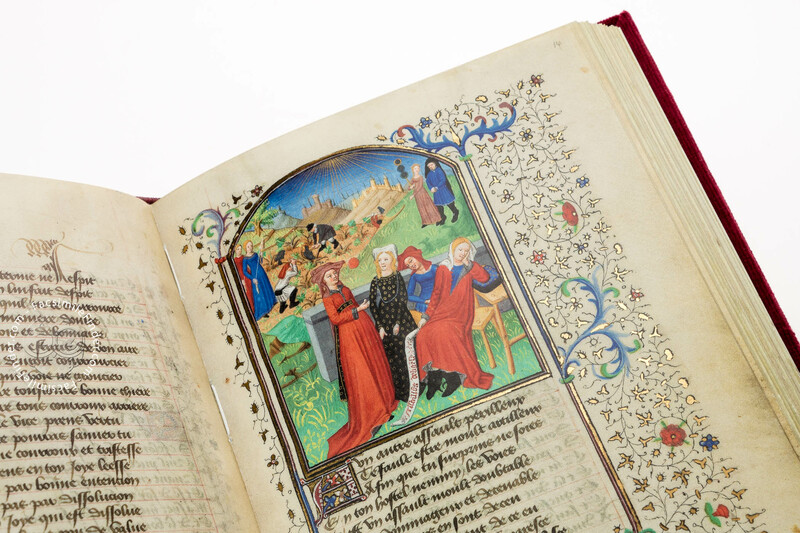 Talented artists such as the Bedford Master in Paris or artists from his immediate surroundings were mutually inspired in the early 15th century, raising the Gothic style to outstanding heights. A new common language of the arts emerged that was understood in Paris and Prague, in Florence and Cologne alike: the so-called "Weicher Stil" (Soft Style) of the International Gothic was born. 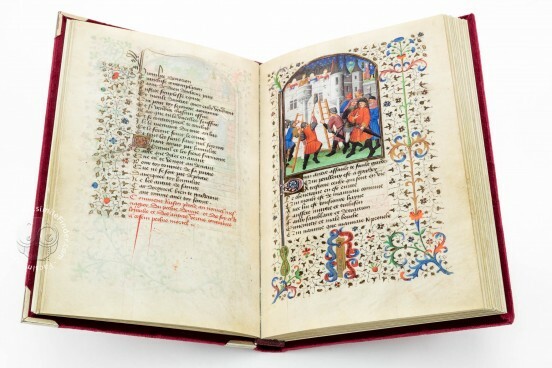 Stimulated by the outstanding art of the Bedford workshop, the artist endorsed the revolution in painting and created a lavishly decorated manuscript which perfectly reflected the harmonious, even poetic character of the Soft Style. 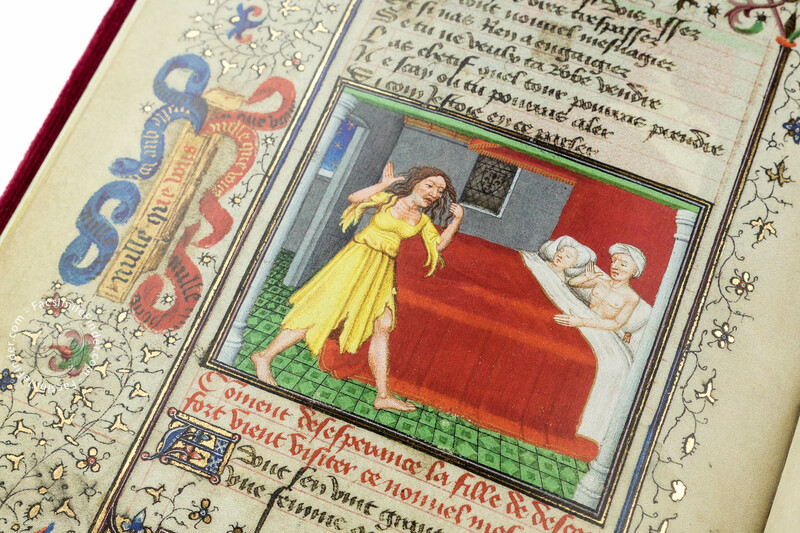 His images help us discover the medieval world largely through details: individualistic facial expressions and countless realistic elements, such as bedroom furniture, tools and garments betray his exact sense of observation. Softly flowing drapery folds create a completely personal form of realistic rendering. Manuscript book on parchment − 20.7 × 14.4 cm − 146 pp. 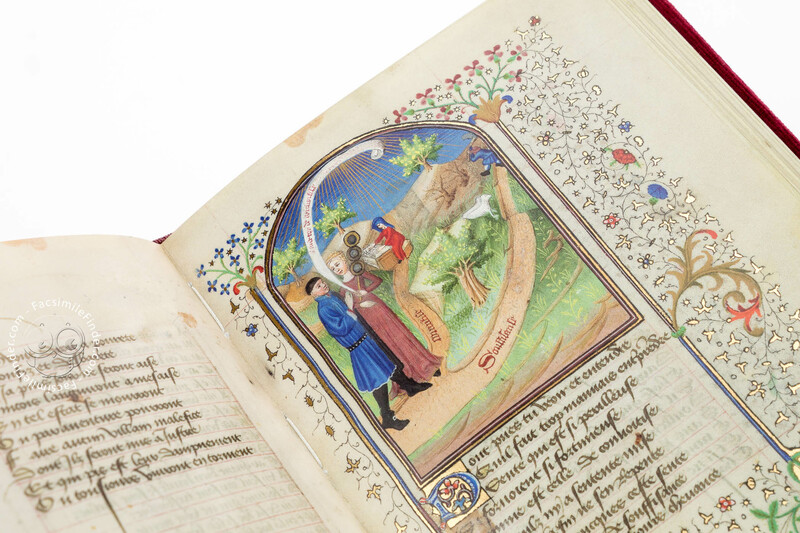 Full-size color reproduction of the entire original document, Jacques Bruyant: The Way of Poverty or Riches: the facsimile attempts to replicate the look-and-feel and physical features of the original document; pages are trimmed according to the original format; the binding might not be consistent with the current document binding. The commentary volume to this facsimile edition includes a complete translation of the text into modern French and German. 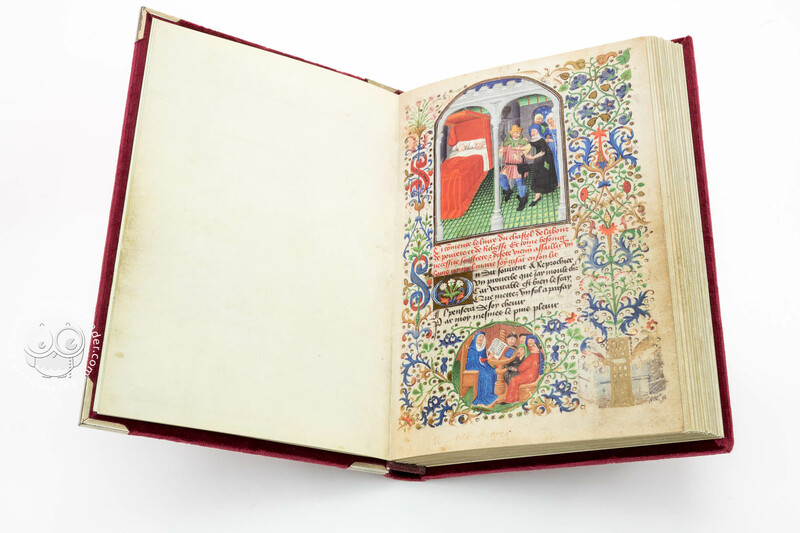 The facsimile is available in an acrylic glass case. 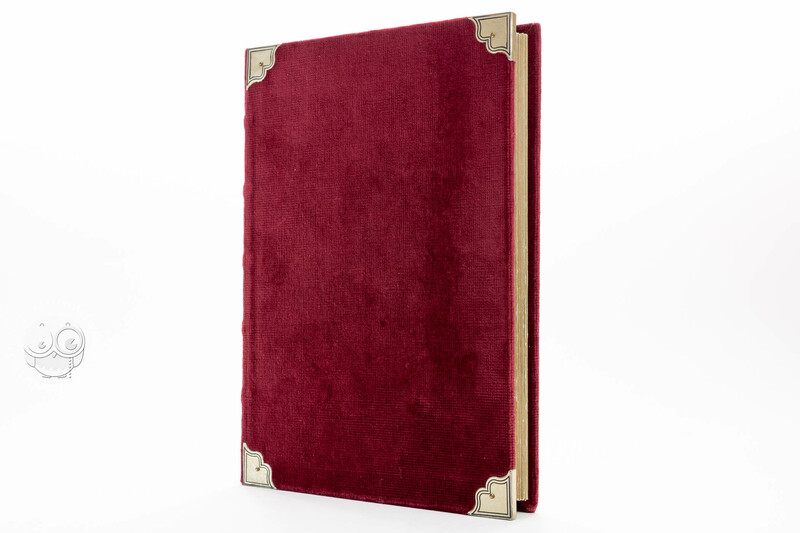 The facsimile binding perfectly imitates the current original binding, a red velvet binding, complete with precious gilt edges and four gilt silver fittings.